Some of the books I am recommending might be a little hard to find. 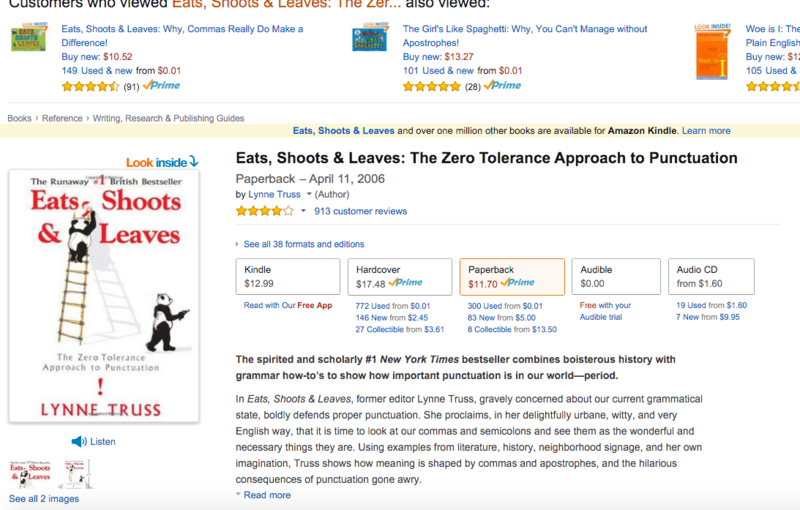 Eats, Shoots & Leaves is everywhere. It has even been broken up into little pieces and made into children’s books. It’s a fun book to read, the author is from England so you will see some interesting differences in the way English is understood between us and them. The book is a good example of learning about something and not studying it. It is about grammar, but it’s not about rules and you don’t have to memorize anything. Reading it you appreciate and enjoy English. English is crazy, and the insights this book offers help us understand and learn how to get along with English on its own terms. The picture is from Amazon.com. This is a great place to look over books. The reviews are mostly thoughtful and you can often look inside at the books and read a few pages. You also have a chance to discover other books that talk about similar things. Enjoy!